It’s hard to imagine an episode of The Big Bang Theory can get any more entertaining in its 12th season. That’s however exactly what this second episode was which, aside from having some good laugh-gags, marked a major step forward for one of the more derided characters on the show. Assuming of course it builds upon this cliffhanger instead of abandoning it like many others. For me, the episode’s most critical plot development was Raj agreeing to an arranged marriage. That should immediately resonate with many Indian singletons in their 30s living out their lives in search of their soulmates, only to frantically settle for a match for fear of missing out. Rajesh finally has that big moment when he sees Stuart landing a girl, which was some clever writing. It should’ve taken a big development to jolt Raj out of his lackadaisical attitude towards life and women and what better way to have that happen than to commit Stuart. I’m also enjoying the geeky romance between Stuart and Denise. For once, Stuart isn’t a sore loser and is actually getting a chance to shine, never mind that he manages to screw it up. Still, I hope Denise continues to stick around Stuart and together, they could end up being the gang’s fifth couple. I can see the show gravitating towards the end where Stuart and Denise are having a snack with the others in Leonard’s apartment. 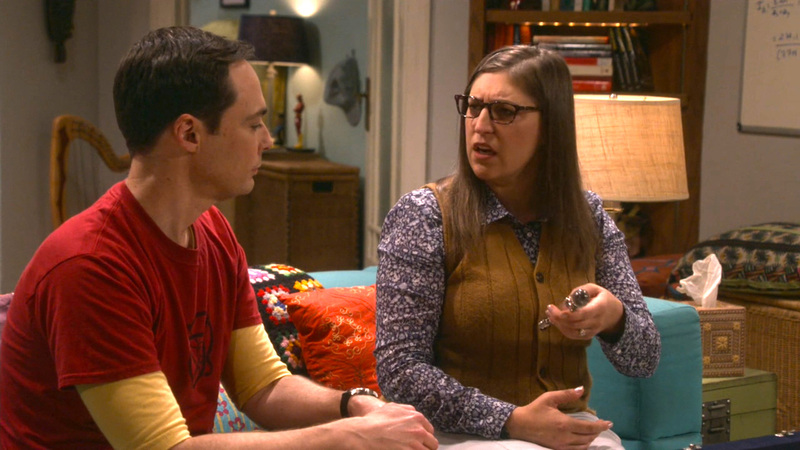 On their part, Leonard and Penny end up sending Sheldon and Amy on a wild goose chase. Mistaking their wedding gift as a scavenger hunt, Sheldon and Amy unexpectedly end up discovering some items which they impart meaning to, and thank Leonard and Penny by forcing them on a hunt of their own. Leonard’s reactions are truly hilarious and it’s yet another reminder of what a great cast who knows their characters inside out can do to a subplot that may otherwise not be as funny as the showrunners believe. Sheldon and Amy are gradually settling into married life and I’m expecting this is going to continue for the next few episodes until a major development happens. On the other hand, the showrunners aren’t doing much with Leonard and Penny and I hope that changes soon as the couple have just been stagnating pretty much ever since they ended up together. The fact that it’s the final season makes certain dynamics open to unfolding out and I’m hopeful some exciting turn of events will play out ensuring the show goes out in style.